• Wear complete eye protection and protective clothing. Avoid touching your eyes while working near a battery. If battery acid contacts your skin or clothing, wash immediately with soap and water. If acid enters an eye, immediately flood the eye with running cold water for at least ten (10) minutes and seek medical attention as soon as possible. • Have plenty of fresh water and soap nearby in case battery acid contacts skin, clothing, or eyes. 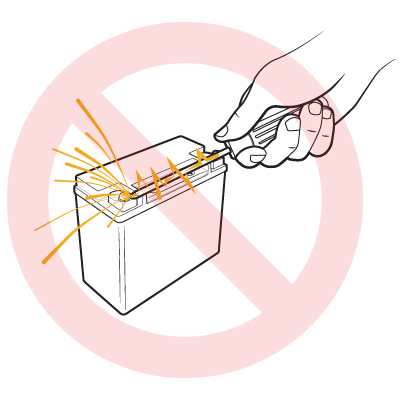 • Be extra cautious when handling metal tools around a battery. If you drop a metal tool near a battery, it might spark or create a short circuit between the battery terminals and some other metal part. Either event may cause a dangerous electrical shock hazard, a fire, or even an explosion, resulting in property damage, personal injury, or death. • Never smoke or allow an open spark or flame in the vicinity of the battery or engine. • Remove all personal items made of metal, such as, rings, bracelets, necklaces, and watches when working with a lead-acid battery. A lead-acid battery can produce a short-circuited current high enough to weld a metal ring or other piece of jewelry, causing a severe burn. • This battery charger is for charging LEAD-ACID BATTERIES ONLY. DO NOT USE THE BATTERY CHARGER FOR DRY-CELL BATTERIES THAT ARE COMMONLY USED WITH HOME APPLIANCES. THESE TYPES OF BATTERIES MAY BURST AND MAY CAUSE PROPERTY DAMAGE, PERSONAL INJURY OR DEATH. •NEVER charge a frozen battery. • To avoid an electric arc (or spark), turn off or disconnect all of the accessories in the vehicle. Always remove the cable that is connected to grounded terminal from battery first. • Make sure the area around the battery is well-ventilated while the battery is being charged. If necessary, use a non-metallic material to blow away the gas in the area. • If necessary, clean the battery terminals. Be careful to keep the corrosion and other debris from coming in contact with your skin or eyes. • If the battery is not a sealed battery, add distilled water to each cell (if necessary) until the battery acid solution reaches the level specified by battery manufacturer. Do not overfill. For a battery without cell caps, such as a valve regulated lead-acid battery (VRLA), carefully follow the battery manufacturer’s charging instructions. • Before charging, carefully read the battery manufacturer’s specific precautions and recommended rates of charge. • Determine the voltage of the battery by referring to the vehicle’s owner’s manual and make sure that the charge mode is set at the correct voltage. • Connect and disconnect the DC output cables only after the battery charger is placed in the STANDBY mode and the AC cord is removed from the electrical outlet. Never allow the battery clamp or eyelet terminal connectors to touch each other. • Locate the battery charger as far away from the battery as possible. • Never place the battery charger directly above the battery; gases from battery will corrode and damage battery charger. • Never allow battery acid to come in contact with the battery charger. • Do not operate the battery charger in a closed-in area or an area with restricted ventilation. • Do not set a battery on top of battery charger.